Apple held their Spring Forward event to showcase HBO Now, the all-new MacBook, and Apple Watch. 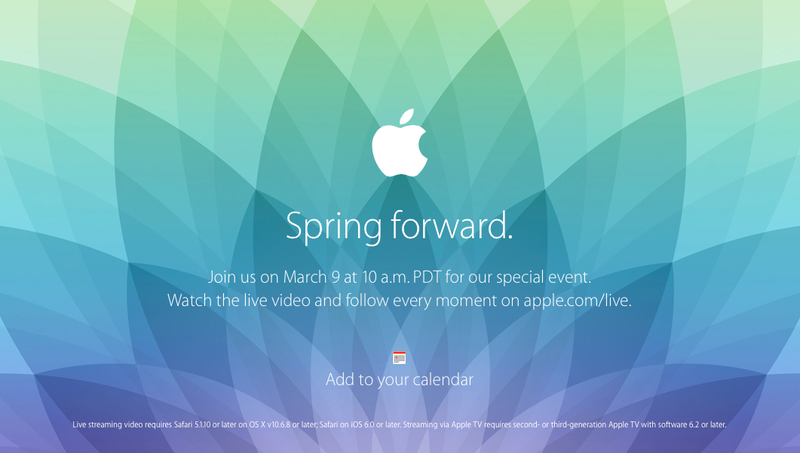 If you haven't yet watched today's event, you can stream it from Apple's website or watch it on Apple TV. The following are my notes and first impressions from today's event. Apple TV gets a price cut to $69. This says to me that the hardware refresh I've been waiting for is either late or under resourced. HBO Now will be available by April 12 for $14.99/mo. This will get cord cutters excited and I think will help drive Apple TV sales. I've never been an HBO subscriber but with a month-to-month subscription, I'd jump on to watch shows that I've not been able to watch before and jump out while the show is on break. Apple Pay now accepted at 49,000 Coca-Cola vending machines. I can totally get behind that! Health + iPhone & Research Kit look really intriguing and can become a powerful diagnostic tool for doctors and patients. Apple is backing up their commitments to privacy by putting data sharing controls into the hands of patients. Apple does not see the data. Ever. Google and Android are going to have a difficult time of tying to copy or buy their way into this segment. Holy crap! This redesigned MacBook is beyond thin! Can you name one company that spends R&D dollars on new keyboard technology? Force Click will make the right-click obsolete on the Mac. Next up on Apple’s hit list: vents and fans. Gone! The new MacBook is powered by the new Intel Core M processor. It runs silently. New battery technology will give you all-day battery life on a single charge. 802.11ac Wi-Fi and Bluetooth 4.0. USB-C connector replaces all of the “old” cables and connectors. Plus it's reversible. Will ship in silver, space grey and gold. Digital Touch is cool if not a bit gimmicky. I'd love to use the tap-tap feature with my wife. Alas, she couldn't care less about Apple Watch. The Activity tracking feature is all of the same stuff that other fitness bands can do, but done in a way that's light years ahead of my Nike+ FuelBand or Jawbone UP. I also like the “you've been sitting still too long” prompt. The new feature in most excited about for the Apple Watch? Maximizing my couch potato time controlling Apple TV without having to use the IR remote. iOS notifications coming into iPhone can be sent to Apple Watch. Looking for granular control here. Don't want my wrist buzzing all day with spam email. Sports teams, Facebook, and news updates. Twitter. Instagram. American Airlines. Apple Pay with Apple Watch looks like a killer feature. Phone calls go between iPhone and Apple Watch over Bluetooth when you're out or on Wi-Fi when you're at home. Watch works with iPhone. Only. Apple Watch iPhone app is where you go to browse, buy and download apps for Apple Watch.